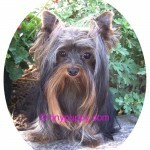 Micro Yorkshire Terrier Puppies are hard to come by. But Penelope is here and just a tiny as can be. 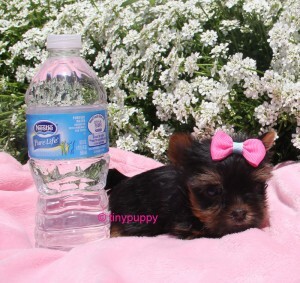 She is 10 oz at 7 weeks of age. 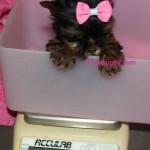 Charting to be 2 lbs full grown. 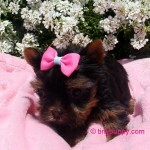 Not only one of the tiniest yorkie puppies, she is beautiful and very sweet. 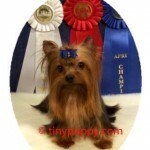 Penelope daddy is an APRI Champion Sire. She is weaning now from Mom. 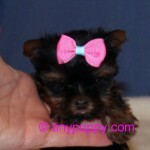 Taking Deposits on this exquisite tiny girl. We will keep her with us until she is fully weaned and eating hard dogfood on her own at 10 – 12 weeks of age. Longer if needed. Micro is a term that we use to discribe our tinest.